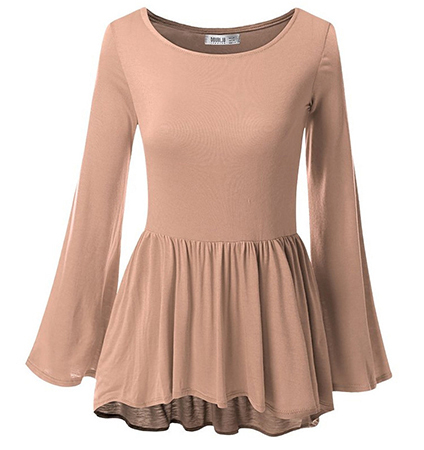 This women’s mini dress is a perky, feminine addition to any wardrobe. It features a simple, beautifully fitted bodice that has a moderately wide, round neckline. The bell sleeves are fitted at the tops and gradually widen into ultra-feminine, draping bells at the ends. The skirt is gathered at the waist and has two layers, providing a moderate amount of fullness. This is a mini length dress with the hemline ending at the upper thigh portion of the legs. It may be machine washed in warm water and tumbled dry on low heat. This dress is available for purchase in sizes Medium, Large and Extra Large.